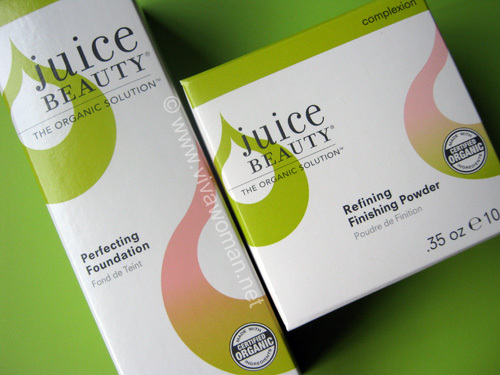 I recently received the Juice Beauty Perfecting Foundation and Refining Finishing Powder complimentary from Juice Beauty in US and I have to say that they impress me more than their skin care range. I know that the company launched their ColorCare makeup range sometime last year but I don’t seem to have seen them in our Sephora here. Either they are not here yet, or I’ve missed them completely. 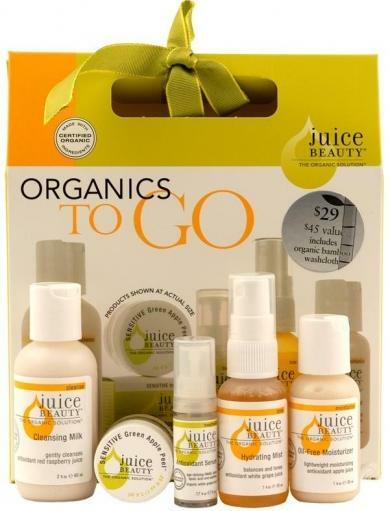 Most of you are probably quite familiar with Juice Beauty’s line of organic skin care products, which are up to 98% certified organic. Their ColorCare makeup range follows the footsteps of their skin care line in using certified organic ingredients such as aloe juice, plant oils, fatty acids and fruit extracts combined with an antioxidant blend of goji berry, aÃ§aÃ­, kiwi, blueberry, grape, pomegranate, cranberry, strawberry and raspberry. Other ingredients include minerals such as mica, iron oxides, titanium dioxide and ultramarine to add color. The products are preservative free, and meet the qualifications of the California Organic Products Act mandating products labeled organic to contain at least 70 percent organically produced ingredients. Ingredients: Aloe Vera (Aloe Barbadensis) Leaf Juice (*), Glycerin, Lecithin (*), Ricinus Communis (Castor Seed) Oil (*), Sesamum Indicum (Sesame) Seed Oil (*), Simmondsia Chinensis (Jojoba) Seed Oil (*), Cera Alba (Beeswax) (*), Vitis Vinifera (Grape Seed) Oil (*), Blueberry (Vaccinium Corymbosum) Seed Oil (Vaccinium Corymbosum)(*), Punica Granatum (Pomegranate) Seed Oil (*), Rubus Idaeus (Raspberry) Seed Oil (*), Actinidia Chinensis (Kiwi) Fruit Seed Oil (Kiwi)(*), Vaccinium Macrocarpon (Cranberry) Seed Oil (*), Fragaria Ananassa (Strawberry) Seed Oil (*), Euterpe Oleracea (Acai Fruit) (Acai)(*), Lycium Chinense (Goji) Berry (Goji)(*), Glyceryl Stearate, Stearic Acid, Euphorbia Cerifera (Candelilla Cera) Wax, Cetyl Alcohol, Xanthan Gum, Tocopherol (Vitamin E), extracts of thymus vulgaris (thyme), melaleuca alternifolia (tea tree), rosmarinus officinalis (rosemary). May contain: titanium dioxide, iron oxides, mica. This Perfecting Foundation is described as being packed with organic ingredients that will leave your complexion looking refreshed and perfected. The combination of organic aloe juice, fruit extracts and minerals provides a cream to powder finish that will wear all day, while giving you a perfect airbrushed look and feel. There’s a sweet orange scent to this foundation that I found refreshing. 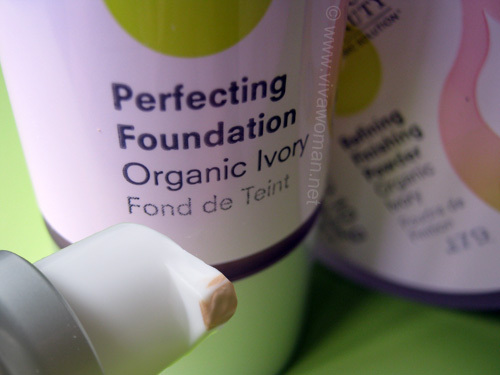 The color that works for me is ‘organic ivory’ and what I like about this foundation is that it is lightweight and easy on my skin. The staying power is good as it doesn’t melt even under hot weather conditions. I think those with little blemishes and pigmented spots will find this coverage good enough for their skin. However, it is not able to conceal my blemishes very well and I might do better with a correcting concealer under this. I also found this a little difficult to blend with my fingers compared to the usual liquid foundation. 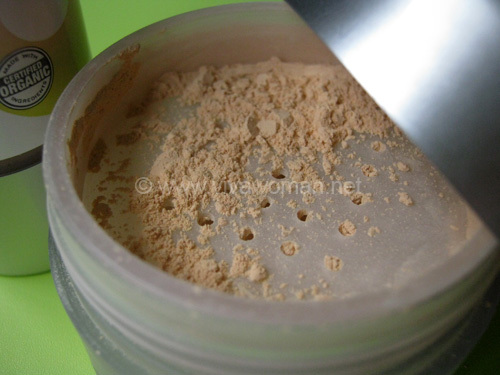 Other than Organic Ivory, this foundation is available in two other shades – Sand and Tan. This Refining Finishing Powder is described as being packed with organic ingredients that will leave your skin refined and flawless. The combination of organic plant powders, fruit extracts and minerals creates a lightweight matte finish that will wear all day, while giving you an airbrushed look and feel. Well, the powder works well with the foundation all right but by itself, it doesn’t create that flawless look though. The good thing about it is that it feels like a mineral powder and hence is very light and will not cause any caking. I like to pat some of this powder over the Perfecting Foundation because it does complete that slightly airbrushed, matt look. I’m using the Organic Ivory shade and the other two shades available are Sand and Tan to compliment the Perfecting Foundation. So here’s a picture of me and my boy posing his cheeky whatnots. I am wearing the Juice Beauty Pefecting Foundation and Refining Finishing Powder in Organic Ivory and I think the foundation and powder does a decent job of a medium coverage with a touch of dewy glow. I didn’t use any concealer in this picture and I kind of like wearing this look on most days when I don’t need that much coverage. I’ve also put together a shot of the coverage on my hand and yeah, I think it does give a someshat refining touch to my skin. As I mentioned, I do like the complexion products as they are lightweight and do a decent enough job for daily wear. But even though the range is made with certified organic ingredients, there are some stuff in them that I do not really like – such as beeswax and zea mays starch. However, I’m generally less picky about makeup products in terms of ingredients as I’m more particular about their coverage and wearability so I’ll let those pass. Maybe I’ll try to get hold of the correcting concealer and see how much better that product increases the overall coverage. For more information on the Juice Beauty ColorCare range, check out their website or sign up their newsletter for updates and promotions. The coverage is amazing based on what it did to your hand. It covered up practically most of the coloured spots. Oh, and you look extremely natural with the coverage you have in the photo. A ‘barely-there’ yet flawless look. VERY cheeky! No spf, though? No, no SPF for this one. I like their Perfecting Foundation a lot. I am using Sand. I totally agree with your review. On the part not so easy to blend with finger, I find it easier to apply with a brush. Ah…I was thinking perhaps I should use a brush. I’ve got one for Ecotools that should work for applying this foundation. the coverage seems very good from the hand photo. when you use this foundation, do you apply it over your sunscreen? Yes, I apply this over my sunscreen. MVO Sun Protection oil first, MVO Facescreen, followed by the Juice Beauty Perfecting Foundation & Refining Finishing Powder. It doesn’t feel heavy with all the layers? 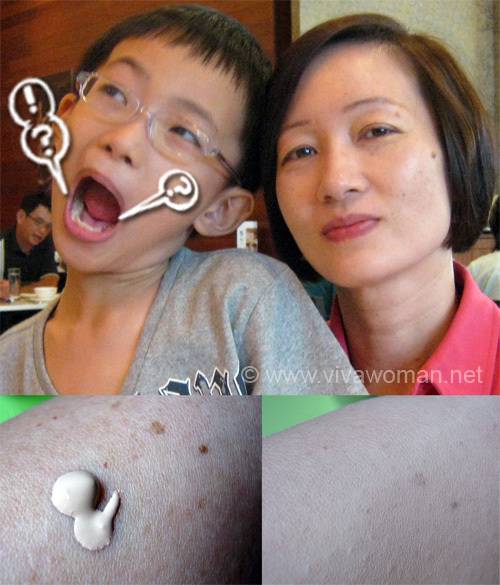 I wouldn’t mind trying out the foundation but I am wondering whether the product is even available in Singapore? If you don’t see it in Sephora, it’s not launched yet. I know it’s available in M’sia though so probably it’ll be brought in soon. At least I can still go to Bud Cosmetics for other brands if I want to try out organic or mineral makeups. In singapore, you can also find the products at Accendo. I believe this is the distributor and that’s their office address? The products retails at Sephora. Sesame, you are correct! I just double checked with our international person. My eagerness to be helpful got the best of me! Feel free to delete that comment and I have a question in to find out if and when Sephora Singapore will be getting these products. No worries? So the Colorcare products are available in Singapore already? Their new products seem promising! I really want to try their tinted moisturizers. Just checked it out on their website. 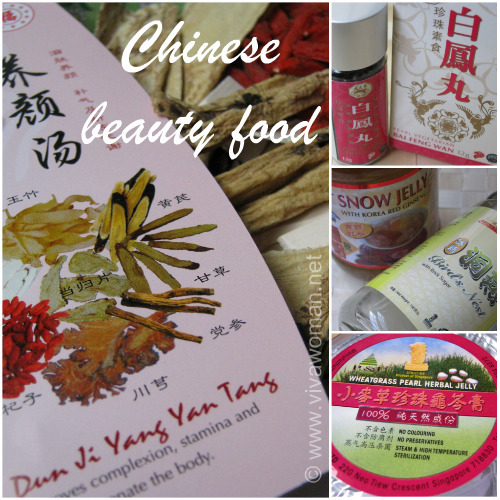 Do you think that these products are non-comedogenic? Thanks so much! : D.
The beewax is a little tricky cos with long term usage, it might clog pores for some skin type.